At the end of June, I was approached by Lauren Smee, owner of Watersplash Swim School to help with the promotion of three areas of her thriving business. The Big Splash – over 70 events over a 4 week period in July and August. 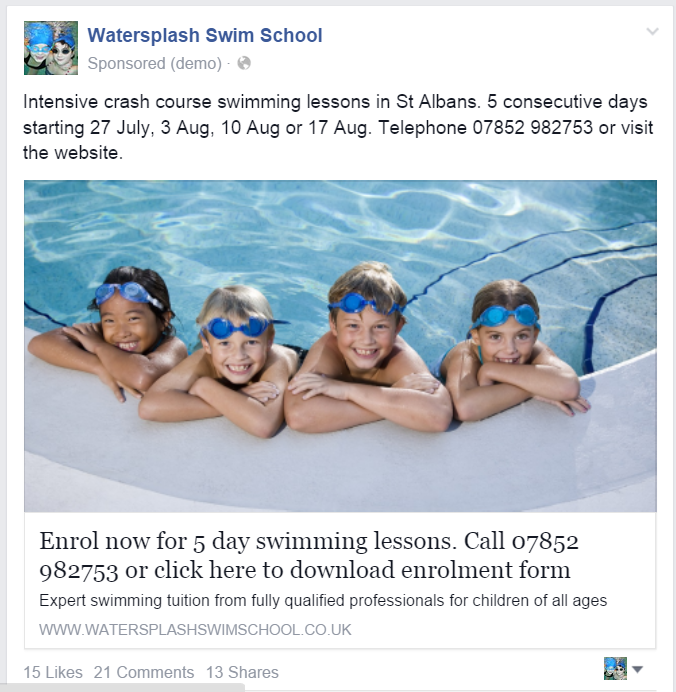 With the summer holidays fast approaching Lauren needed to get the word out quickly to the St Albans community about the range of activities she was holding at a local school including scuba diving, canoeing, water zorbing, synchronised swimming. The sessions were aimed at children over the age of about 5. Lauren also runs week long intensive swimming lessons over the summer holidays for children wanting to learn and improve on their swimming. 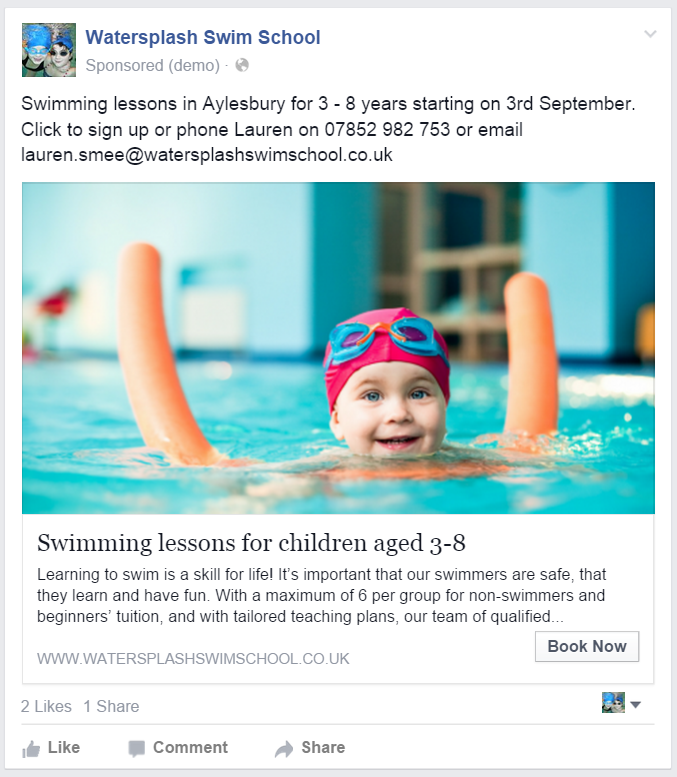 Finally, there are the traditional termly swimming lessons at four locations – Aylesbury, Finchley and two in St Albans – which teach children over the age of 3. We chose Facebook advertising as the best medium for spreading the word. The main reason for choosing Facebook is that the targeting is extremely specific. In other words the advert can be placed in front of exactly the right audience. For the Big Splash I selected women between the ages of 30 and 45 with children between the ages of 6 to 12 years who live within 10 miles of the centre of St Albans. For the other adverts slightly different demographics were selected in order to meet the target audience. The aim of drilling down and being specific is that you are not wasting your advertising spend showing adverts to people who are irrelevant. There is a balance between too narrow an audience which may be cheap and too large an audience which will cost more per click. The adverts were placed on both desktops and mobiles when connected to wifi. The next task was to design the adverts. Adverts contain both images and copy. With images it is best to include an image with people looking into the camera. In this case we made sure it was consistent with the images on the website. The written copy gave the visitor clear indication of the what, when and where of the Big Splash and the intensive courses. In the course of the running the adverts we changed the copy to include Lauren’s contact details. This improved the booking rate and also meat we were not even paying for clicks! 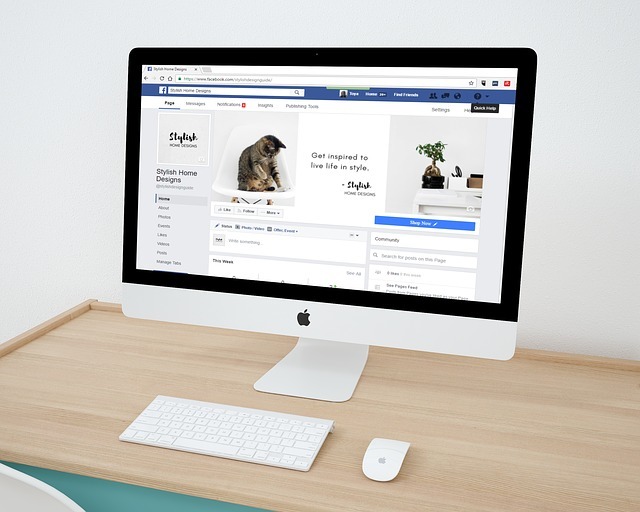 Setting a budget when you start out with Facebook advertising is a tricky topic. In this case the aim is to obtain the lowest cost per click whilst filling the events. Remember that even if you install tracking codes you may still get people visiting your website or contacting you as they may phone you, type in your website address or send you an email. For this reason it is always important to collect as much information as you can from prospective customers. 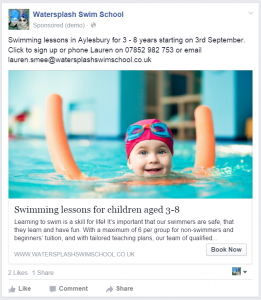 The budgets varied for each advert – the Big Splash need a large reach very quickly and so the daily budget was set higher than the adverts for the weekly lessons starting in September. Lauren has been very satisfied with the results so far from these campaigns. Her already successful swimming school has been exposed to a wide audience as she is getting booking from a fresh customer base. This has been helped by the social interaction on the adverts themselves. Looking at this advert there have been 15 likes, 21 comments and 13 shares. Any bookings which are made as a result of these social interactions is essentially free traffic. To keep the advert fresh I will evaluate the different click through rates for the different images and copy. In addition, the advert will be changed once it has been seen about 4 -5 times by the same audience. Widening the audience is an option which is worth considering as the number of clicks diminishes over time. As with any advertising it is case of monitoring the results, trying new ideas and keeping an eagle eye on the return on your investment. For Watersplash Swim School, the campaigns have been a resounding success. If they are planning expanding into other locations, Facebook advertising will be a great way to reach their perfect audience. 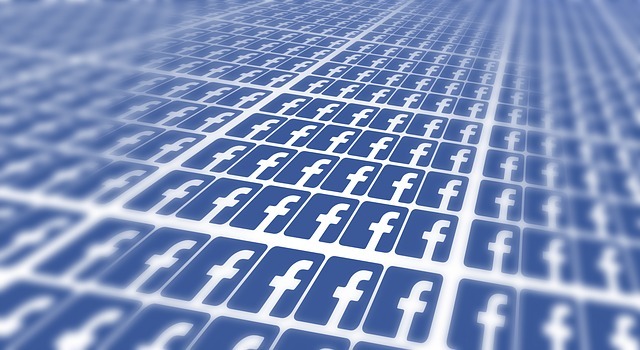 Is Facebook Marketing just too complicated for small businesses?